BCA-13-00015: Formal application made to the Bricktown Design Review Committee to be heard 8/14/13. "Construct a 4-story, 250 unit apartment building with 10,640 SF of retail space and construct a five level parking garage." Demolition of the Stewart Metal Fabricators buildings to begin in January 2013. Cleanup, relocation of sewer lines and utilities expected to continue for 12 to 15 months. Construction could begin in early 2014. Can't wait to see the design. 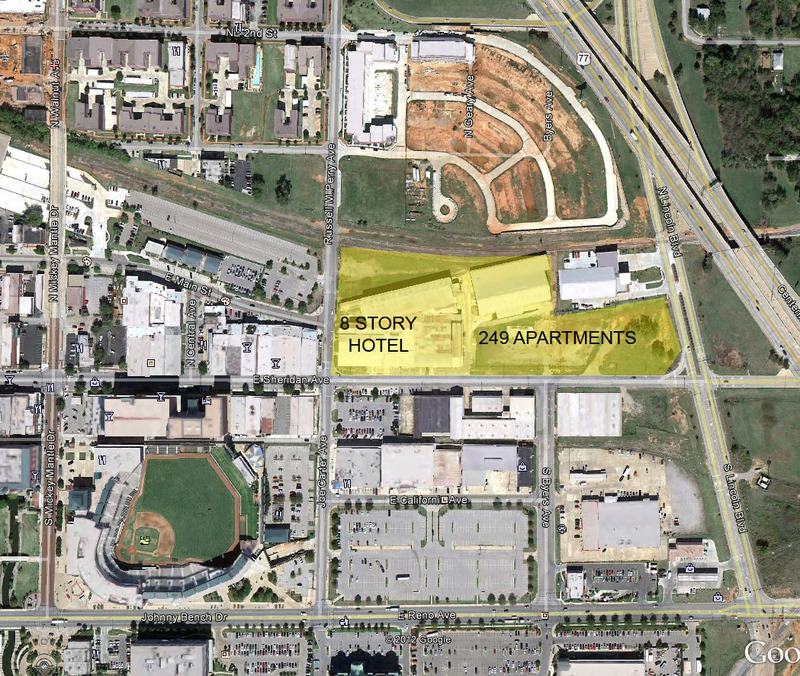 Doesn't the yellow highlighted area include the Bricktown Fire station? 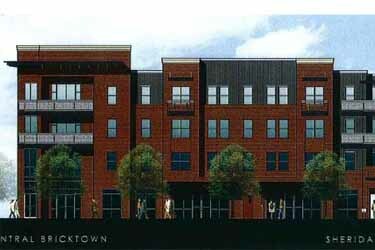 Not only would this bring more life to Bricktown it really helps solidify Deep Deuce and areas adjacent as a good concentration of living units. I'm not very familiar with the history of the location. What does Meinders have to do with it? Does he own the land and asked some ridiculous price for it? Or is it something else. I think this has the potential to a fantastic addition to Bricktown. What exactly will the $4.5 million grant cover? The land or the construction or both? Thanks for pointing that out. I changed the graphic. We need some entry-level apartments in that area for students and the younger crowd. There is a way to keep things simple and efficient without completely cheaping out. True...let's hope for the best, this will give new life to good ol' Bricktown.. Moreover, 8 stories for the hotel is a decent size, I wonder who will be pe the operator? Probably Holiday Inn? Interesting how these funds were originally targeted for Core to Shore. Just another sign that downtown is not ready to expand horizontally until it expands vertically. As important as anything here is not just what is gained, but what is lost. Those fabricator buildings are such a terrible entrance to Bricktown. Would this get rid of them all? Interesting, I know Andy Burnett. He's a local commercial Realtor, fairly young. Anyhow, this would be HUGE for Bricktown and is needed for long-term viability. I can't find it on OKC.gov, but there was recently the completed Bricktown Strategic Plan, and on a map it showed a Candlewood Inn and Suites as a future hotel, along with Aloft and Hilton Garden Inn. The identifying dot was east of Lincoln and I was struck as it being an odd location; this Brooks project is probably what they were talking about/leaked. Something like a slightly more urban Lincoln at Central Park would succeed wildly here if that's what they are thinking (a 1 bedroom starts at about 700/month there). I've learned not to get my hopes up about things that don't have financing lined up, but consider me cautiously optimistic about this. 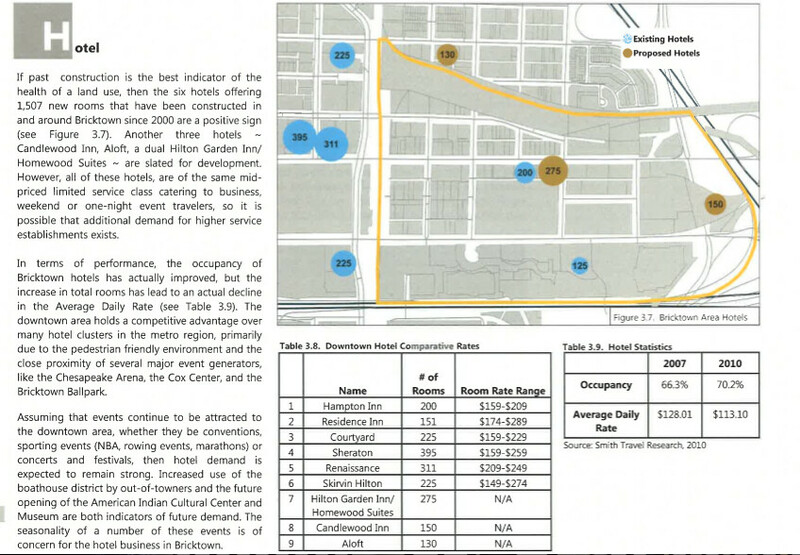 Who knows?, maybe this is just another separate hotel project that has been leaked, Bricktown would seem to be pretty well saturated/at market capacity with hotels if this is separate from Brooks' proposal and they both came to pass. If I am correct this has to past Bricktown Design Committee. Say what you will about that, but nothing ugly has been build under their rule. That hotel was proposed a few years ago. Nothing has moved on it. I think it should be more like the Regency or less really: 600-700 for a one bedroom, 500-600 for a studio even; those would be great prices for students, especially with a roommate. Never heard of it, thanks for the info. My mistake.